No, unless the mission calls for killing targets you can simply bullet jump through the entire level, completely ignoring different enemy types and chokepoints. This happens now in Anthem and is doubly annoying when combined with the tethering system that spurs more loading screens when randos in your PUG race ahead of you zooming over enemies. The tethering then reloads you in between groups of mobs and you wipe. Legendary Missions : Allows you to replay critical path missions again with a much higher difficulty level. One mission will be available per day that has no limit on the number of times it can be completed. These missions offer a new challenge and require team coordination to achieve victory! Elysian Caches : Earn Elysian Keys by completing daily challenges. These keys can be used on Elysian Caches, which appear at the end of each Stronghold after the boss is defeated to unlock vanity and crafting materials. Opening an Elysian Cache creates loot for each member of the Expedition. There are 67 unique vanity unlocks available, including vinyls, victory poses, emotes, and arrivals. You will never get a duplicate vanity item! This is our first version of the ruleset for Elysian Caches in the game and we’ll look forward to your feedback and the data we gather from your play. Chests now have a chance to drop additional items and crafting materials in Strongholds, Freeplay, and Missions. Ground FOV: Adjusts the field of view of the camera during on-foot gameplay. Pilot FOV : Adjusts the field of view of the camera when out of your javelin. Heart of Rage: Fixed issue where late-joining players would spawn in lava and in a downed state. Temple of the Scar: Fixed issues with fog walls that could prevent the player from progressing. Additional reduction and tuning to health of The Monitor boss fight in the Heart of Rage Stronghold. Corrected several inscriptions where the magazine size was referred to as “clip.” Fixed to say “magazine” or “mag” (e.g. +X% Weap Mag Size”). The Weapon Reload stat inscription was not correctly applying to player weapons and has been corrected. Shield Delay: Increases the speed at which your shield recharges. Shield Refresh: Reduces the time between when your shield breaks and when it starts regenerating. Fixed a number of issues that could cause the game to crash. Daily/Weekly/Monthly interaction points now directly link the player to the Cortex entry. Match consumables now sort by rarity, then alphabetically. 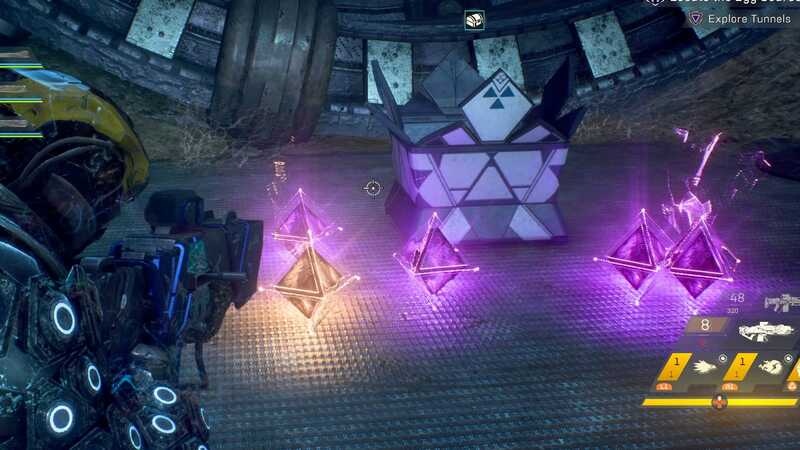 Fixed several exploits related to Masterwork and Legendary drops that were allowing unintended drop rates when player was downed. Added a new audio effect for when a Masterwork/Legendary item drops in-game. Was : Hitting enemies with Ordnance Launcher abilities temporarily lowers thruster-heat buildup by 30% for 5 seconds. Now : Taking damage increases all damage by 8% for 10 seconds, stacking to 10. Was : On shield break increases all ability damage by 40% for 5 seconds. Now : When hit with a status effect, increase all gear damage by 40% for 10 seconds. Was : Victor’s Advantage: Defeating an enemy increases Flamethrower damage by 30% for 10 seconds, stacking to 5. Now : Striker’s Advantage: Hitting an enemy increases Flamethrower damage by 12% for 10 seconds, stacking to 10. Was : Upgraded Burst Mortar: Special shells burst across wide area. Burst Mortar can now trigger explosive combos. Now : Upgraded Burst Mortar: Special shells burst across wide area. Creates a large physical explosion for each enemy hit. Was : Performing a small melee hit-streak (3) detonates an electric explosion. Now : Melee hits detonate an electric explosion, can occur once every 2 seconds. Was : All damage is increased by 25% for 5 seconds when suit health declines. Now : On low armor, damage taken is reduced by 50% for 10 seconds. Was : Increases all gun damage by 25%. On low health, increases gun damage by 25% for 10 seconds. Now : Increases all gun damage by 25%. On low health, increases gun damage by 60% for 10 seconds. Now : Increases fire damage and max heat capacity by 50%, and fire resistance by 50%. On a hit streak (5), applies acid to the target. Was: Upgraded Seeker Grenade: Splits into seeking submunitions. Ambusher’s Fury: Defeating enemies from above grants 75% increased weapon damage for 20 seconds. Now: Upgraded Seeker Grenade: Splits into seeking submunitions. Striker’s Fury: Hitting enemies grants 60% increased weapon damage for 20 seconds. Was: Upgraded Burning Orb - Combo Effect: Chain. Striker’s Wrath: After hitting an enemy, gain 5% increased damage for 5 seconds stacking to 20. Now: Upgraded Burning Orb - Combo Effect: Chain. Striker’s Wrath: After hitting an enemy, gain 10% increased damage for 10 seconds stacking to 10. Symbiotic Surge : Increases javelin armor by a large amount. Increases all damage by 50% for 10 seconds when picking up a repair pack. Thermal Cooling: Increases the javelin’s heat capacity to allow the javelin to fly more effectively. Reduces time you stay overheated significantly. Change list looks fantastic. Really looking forward to tweaking my ranger loadout and maybe giving interceptor a try for the first time. I just started running GM1 content last week, and I’ve had a really mixed bag in terms of my survivability. The first run I kept getting downed very quickly, but the ones since I’ve only been downed a few times when it seemed justified (for lack of a better word). After the first run I almost stopped running GM1, thinking maybe I wasn’t geared for it (I think I was just about 450), but now I’m wondering if I just got hit by the health bug. Each run I also used the elite armor consumable. So I’ll be trying some runs this week in GM1 again to see how I fare. I also got hit a bunch of times by the fog walls in both Temple of the Scar and Heart of Rage, so hopefully that’s not an issue any longer. Crappy loot is still purple. now I’m wondering if I just got hit by the health bug. This is likely what’s going on. It can get pretty bad. Those look like fantastic changes. If they can give me some way of re-rolling individual inscriptions for a cost or otherwise allow me to focus on getting specific bonuses to put together a gear set I’ll probably jump back in. That would be interesting. I’d still love to see a number of inscriptions combined or condensed as mentioned upthread as well. There’s just way too many variations on similar inscription themes. As much as it would be a little bit of fun to try to max out some particular stat (could you get a Storm’s shield delay down to a few seconds? ), there’s not enough inventory slots and inventory management is too much of a chore. Stronghold bosses no longer guarantee masterworks, just received 4 purples from the monitor on GM2. Get ready for everybody to start leaving at the boss again! Teammates can now pick up your loot for you, so your inventory is constantly getting filled up with blues and purples. Half the items in freeplay and stronghold chests have been replaced with embers. A hotfix or another client update needs to go out ASAP to fix this, because this is horrible. Edit 2: They really needed to get the loot portion of this update right, and they actually made it worse than it was before, I have no idea what they think they’re doing over there. Something something if there was text chat you could at least communicate with the group not to waste everyone’s time. As far as I could tell Items have not been replaced with embers, they just added embers. A group of 4 ran temple of scar on gm2. 3 legendary drops in the group. Not bad. Ranger changes are fantastically fun. Are the thruster/overheating changes noticable? Best Defense seems to have been nerfed a bit. I used to be able to spam it by hitting walls, the floor, allies or basically anything to get health back. No longer. That sounds like a bug fix, not a nerf. @Alistair I don’t remember it feeling any different, honestly. On the upside, performance on PC seems slightly better. They also fixed the infinite health exploit with the Storm javelin but the intermittent 9/10 Ice Shard spam glitch (where you can constantly spam Ice Shard and it doesn’t count down to 0/10 properly but resets to 9/10) still happens but isn’t as game-breaking since it does so little damage. Now that you mention it, I don’t remember any hitching at all when playing earlier. The Ranger/ Colossus changes are fantastic. Many interesting builds have opened up. But they actually nerfed loot even more. GM2 is all purples and blues. You don’t even get the guaranteed MW from Strongholds, now, so it’s nothing at all. I also opened two Elysian chests. Both contained… 80 colossus parts (Javelin parts are the least useful of all crafting items). I’m out, I think. BW just doesn’t know how to do this. I’ve not had time to play a lot of the game yet, and mainly play MP with some friends. I still enjoy it for the core gameplay, but I don’t really feel Fort Tharsis or the world. *= I have no idea if any of the strongholds does this already, though. Multiple reports of 20% less flight time instead of the increased flight time the patch notes suggested. I don’t know about 20%, but I definitely feel like I’m flying for less time before overheating.